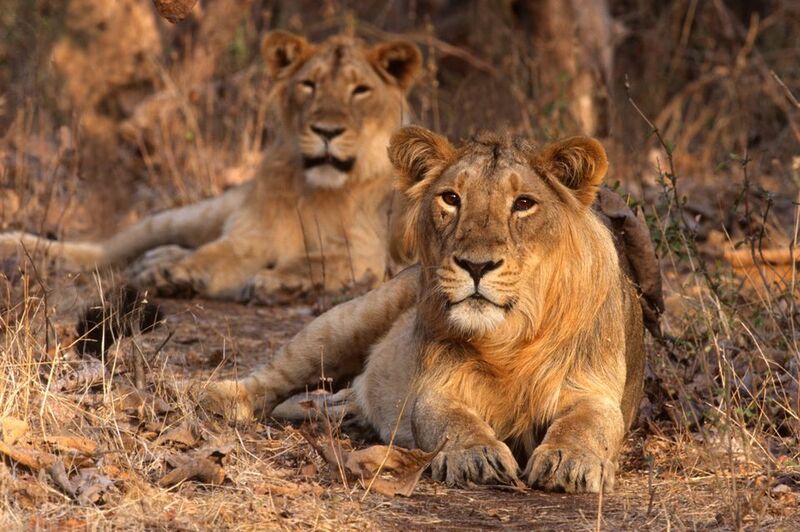 Gir National Park attracts droves of visitors to see the Asiatic lion in the wild, as it's the only place in the world where these creatures are now found. Once almost hunted to extinction and listed as critically endangered in 2000, Asiatic lion numbers have recovered well due to conservation efforts. The park's core zone, which extends for almost 260 square kilometers, was declared as a national park in 1975. However, the sanctuary was set up a decade earlier. According to the latest census in 2015, the number of Asiatic lions in Gir and the surrounding area increased by 27% since 2010. The total lion population was recorded at 523, consisting of 109 males, 201 females, and 213 sub-adults and cubs. In March 2018, the Gujarat government announced that a recent unofficial count found more than 600 lions in the area, up from 523 in the 2015 census. The next official census will be in 2020. Gir's forested hilly terrain makes it a preferred habitat for the jackals, leopards, antelope, and deer that also live there. It's home to crocodiles, and over 300 species of resident birds as well. Gir National Park is situated in the southwest part of Gujarat state, 360 kilometers from Ahmedabad, 65 kilometers from Junagadh, and 40 kilometers from Veraval. It's inland from the beaches of Diu. The entrance to the park is located at Sasan Gir village, and this is where the park reception and orientation center is (next to the forest department's official Sinh Sadan guesthouse). There's also a Gir Interpretation Zone, also known as Devalia Safari Park, 12 kilometers west of the village, at Devalia. It's an enclosed area of around four square kilometers that contains a variety of wildlife, including lions. A bus takes visitors on a 30-40 minute tour of it. The nearest major airport is in Ahmedabad, about seven hours away. There's also a smaller airport in Rajkot (three hours away) and another at Dui (two hours away). The nearest railway station is at Junagadh, and this is the most common approach to the park. The railway station there receives trains from Ahmedabad and Rajkot, and major cities interstate. Then, it's an hour and a half by road to Sasan Gir. Going via Veraval, it's one hour. If you don't want to take a taxi, pubic buses run regularly to Sasan Gir from both places during the day. Alternatively, many people prefer to take a private bus to Sasan Gir from Ahmedabad as it drops them right next to the Sinh Sadan guesthouse and reception center. Hence, it's more convenient than the train. The journey takes seven hours, and buses can be arranged from the the private bus stand near Paldi bus stop. There's no need to book in advance. The most popular time to visit Gir is from December to March. However, it can get very crowded during peak times with long waits. You're more likely to see wildlife, such as lions, when it's hot (from March to May), as they come out to get water. The best safari to go on is undoubtedly the first one of the morning, when the lions are most active. They tend to sleep for the rest of the day and don't move around much! Weekends and holidays are to be avoided due to the crowds and higher fees charged. Gir National Park is open from mid October until mid June. There are three, three-hour Gir Jungle Trail jeep safaris per day inside the park. They start at 6.30 a.m., 9.00 a.m., and 3 p.m. The Devalia Safari Park is open all year round, from Thursday to Tuesday (closed Wednesday), 8.00 a.m. until 11 a.m., and 3.00 p.m. until dusk (around 5 p.m.). Monday to Friday: 800 rupees for Indians and 4,800 rupees for foreigners. Saturday and Sunday: 1,000 rupees for Indians and 6,000 rupees for foreigners. Festival Days (Christmas, Diwali, and Navaratri): 1,000 rupees for Indians and 6,000 rupees for foreigner. Note that the festival periods, for which the higher charges apply, extend for about two weeks from the festival dates. You'll also need to pay for a guide to accompany you inside the park (400 rupees), the cost of hiring a jeep (2,100 rupees, available at the entrance), and DSLR camera charge (200 rupees for Indians and 1,200 rupees for foreigners). Foreign tourists need to be aware that it is expensive to visit Gir, and that the camera fee is extremely (and unreasonably) high. As a result, many find the experience to be disappointing and not worth the money. Festival Days: 190 rupees for Indians and 3,000 rupees for foreigners. Permits for both Gir National Park (Gir Jungle Trail) and Gir Interpretation Zone (Devalia Safari Park) can be booked online here. The earliest that bookings can be made is three months in advance, and the latest is 48 hours beforehand. Only 30 vehicles are allowed in the national park at a time, so permits for the Gir Jungle Trail are limited. Do note that all permits for the Gir Jungle Trail MUST be obtained online. This decision was made in late 2015 to prevent touts from selling permits to visitors. It's not mandatory to make bookings for Devalia Safari Park online. The main problem for foreigners, who are willing to pay the exorbitant charges, has been that the online booking system will only accept Indian debit and credit cards. As a result, they've been unable to make bookings themselves from abroad. In early 2018, the forest department announced that a facility would be added for international cards. In order to hire a jeep (gypsy), you must report with your permit to the reception center at government-owned Sinh Sadan guesthouse, at the safari entry point. Arrive around 30-45 minutes before your safari is scheduled to depart so that you have plenty of time. Certain types of private vehicles are allowed in the park but only if they use petrol. A driver and guide are still required. There are eight safari routes, although most overlap with each other, with different entry and exit points. They're randomly assigned by the computer (along with a driver and guide) when you present your permit. Vehicles must all move in one direction along the routes, without reversing or diverting. Unfortunately, there are reports of forest workers herding the lions to certain areas so tourists can see them. Sinh Sadan is the most economical option, and is where most Indian tourists stay. The rooms are relatively inexpensive and the garden setting appealing. Expect to pay 1,000 rupees per night for a non-air conditioned room, and 3,000 rupees per night for air conditioning. However, the rates are higher for foreigners, service is rather poor, and the guesthouse is a challenge to book. Reservations need to be made a month in advance. Phone (02877) 285540 but be persistent, as the number is often busy. After booking, you'll need to fax application and ID, confirm they've received it, and then send check or demand draft for payment. If you can't get accommodations there, try the budget Hotel Umang nearby. It's bookable online. The Taj Gateway Hotel Gir Forest shares the same fabulous location and is an excellent choice if you have the budget for it. Another hotel that's worth splurging on is the Fern Gir Forest Resort. A bit cheaper, the Maneland Jungle Lodge, around three kilometers from the park entrance, is popular. An excellent eco-friendly option is Asiatic Lion Lodge. It opened in early 2014 and is the first eco-tourism project at Gir. Gir Birding Lodge is a good choice for those into birding, as bird and river walks are offered. It's located not far from the park entrance. If you're looking to save money and don't mind staying a bit away from the entrance, there are many decent and inexpensive hotels on the way to the Gir Interpretation Zone at Devalia.